Carrier hotels are an integral part of global communications infrastructure. The carrier hotel serves a vital function, specifically the role of a common point of interconnection between facility-based (physical cable in either terrestrial, submarine, or satellite networks) carriers, networks, content delivery networks (CDNs), Internet Service Providers (ISPs), and even private or government networks and hosting companies. In some locations, such as the One Wilshire Building in Los Angeles, or 60 Hudson in New York, several hundred carriers and service providers may interconnect physically within a main distribution frame (MDF), or virtually through interconnections at Internet Exchange Points (IXPs) or Ethernet Exchange points. Carrier hotel operators understand that technology is starting to overcome many of the traditional forms of interconnection. With 100Gbps wavelengths and port speeds, network providers are able to push many individual virtual connections through a single interface, reducing the need for individual cross connections or interconnections to establish customer or inter-network circuits. 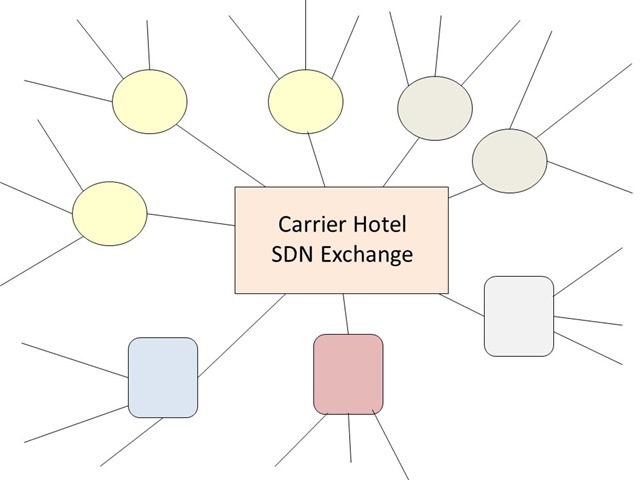 While connections, including internet peering and VLANs have been available for many years through IXPs and use of circuit multiplexing, software defined networking (SDNs) are poised to provide a new model of interconnections at the carrier hotel, forcing not only an upgrade of supporting technologies, but also reconsideration of the entire model and concept of how the carrier hotel operates. Several telecom companies have announced their own internal deployments of order fulfillment platforms based on SDN, including PacNet’s PEN and Level 3’s (originally Time Warner) pilot test at DukeNet, proving that circuit design and provisioning can be easily accomplished through SDN-enabled orchestration engines. However inter-carrier circuit or service orchestration is still not yet in common use at the main carrier hotels and interconnection points. Taking a closer look at the carrier hotel environment we will see an opportunity based on a vision which considers that if the carrier hotel operator provides an orchestration platform which allows individual carriers, networks, cloud service providers, CDNs, and other networks to connect at a common point, with standard APIs to allow communication between different participant network or service resources, then interconnection fulfillment may be completed in a matter of minutes, rather than days or weeks as is the current environment. This capability goes even a step deeper. Let’s say carrier “A” has an enterprise customer connected to their network. The customer has an on-demand provisioning arrangement with Carrier “A,” allowing the customer to establish communications not only within Carrier”A’s” network resources, but also flow through the carrier hotel’s interconnection broker into say, a cloud service provider’s network. The customer should be able to design and provision their own solutions – based on availability of internal and interconnection resources available through the carrier. Participants will announce their available resources to the carrier hotel’s orchestration engine (network access broker), and those available resources can then be provisioned on-demnd by any other participant (assuming the participants have a service agreement or financial accounting agreement either based on the carrier hotel’s standard, or individual service agreements established between individual participants. While layer 1 (physical) interconnection of network resources will always be required – the bits need to flow on fiber or wireless at some point, the future of carrier and service resource intercommunications must evolve to accept and acknowledge the need for user-driven, near real time provisioning of network and other service resources, on a global scale. The carrier hotel will continue to play an integral role in bringing this capability to the community, and the future is likely to be based on software driven , on-demand meet-me-rooms.